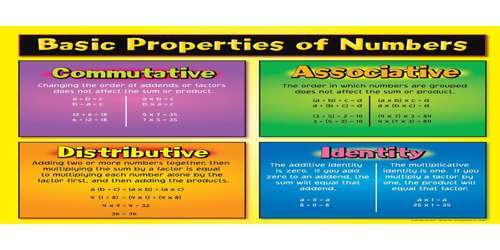 There are four basic properties of numbers: commutative, associative, distributive, and identity. Basically, there are three properties. These are the commutative, associative, and the distributive property. However, we can extend them to include the properties of zero and one. 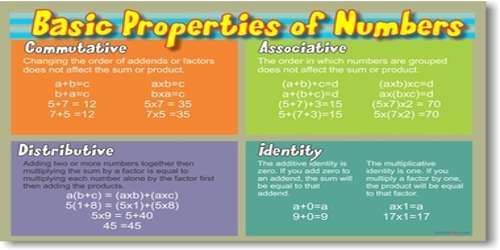 We also called these properties rules of arithmetic. It is especially important to understand these properties once you reach advanced math such as algebra and calculus. The distributive property is explained with three good examples. The sum of two numbers times a third number is equal to the sum of each addend times the third number. Example; 5 x (7 + 2) = 45 or 5 x 7 + 5 x 2 = 45.